The new law stems from a case where a toy company demanded a customer to remove a negative online review. The customer refused so the toy company demanded a $3,500. payment from the customer because the toy company’s terms of service included a non-disparagement clause. The impact of this law will be felt by businesses who have non-disparagement clauses in their terms of service. 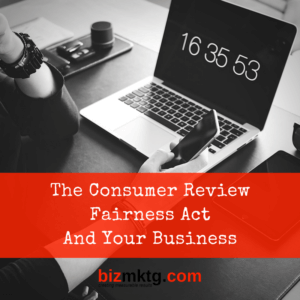 Some businesses may use this language in their existing customer agreements or terms of service and this law will most likely render those particular clauses unenforceable. Rather than threaten customers with legal action for negative reviews, the best way for a business to avoid negative reviews is provide excellent service in the first place. Proactively ask your customers for feedback to find out how your business is doing…in their eyes. When you detect a negative experience by a customer with your business, TAKE ACTION. Contact the customer and find out what went wrong and how you can make it right. Even if you can’t make everything right with the customer, you’ve made the effort and that goes a long ways in most reasonable customers eyes. If your business needs help monitoring its reputation, gathering feedback and get more reviews, please contact bizmktg.com (800) 808-0249 today.